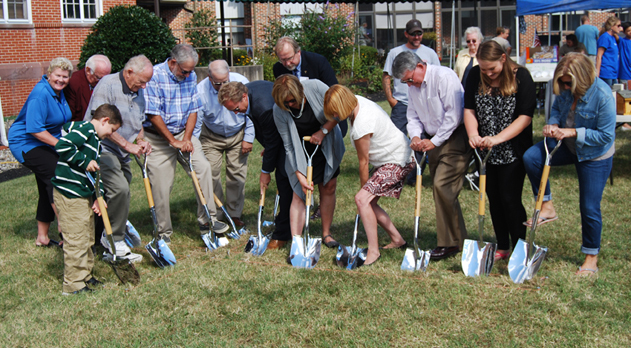 Participants in the Old Main project launch break ground in the shape of a cross. Nearly 120 years after the first superintendent of the Topton Orphans Home began construction of the home’s iconic Old Main building by digging out, “in the shape of a cross … several wheelbarrowsful of ground,” participants in a groundbreaking for a major renovation project of the building honored those beginnings by overturning soil dug in the shape of a cross. Several hundred people including area residents, home alumni, Diakon staff, board members, adoptive and foster parents, residents of The Lutheran Home at Topton senior living community and local political officials participated in a celebratory event to launch the $8.2 million renovation and refurbishment project. In addition to the groundbreaking, the event featured the naming of the adoption- and foster care-focused facilities to be established in the building as the Helen N. Palmer Center for Permanency. A significant bequest from Mrs. Palmer of Wyomissing, who passed away in 2012, provided seed money for the project, which also will include bank financing and a fundraising campaign. Project construction will begin later this fall, with a tentative completion date of late 2017. In addition to exterior and mechanical systems work, the project will turn the currently unused second floor of the 32,000-square-foot building into the Diakon Adoption & Foster Care permanency center as well as create space for Diakon Ministry Support offices currently located in the Medical Arts Building on the Luther Crest campus, Allentown. “Having the groundbreaking in the shape of a cross was not only a fitting way to honor our history and the Rev. Uriah P. Heilman, who undertook that first groundbreaking so long ago, but also to reflect our faith-based mission to serve our neighbors,” says Mark T. Pile, Diakon president/CEO. The event included activities for children, participation by community organizations including food cooked and served by local Boy Scout troops, music performances including selections by the Brandywine Heights High School band, a blessing of the site and tours of Old Main. The “center for permanency” related to Diakon Adoption & Foster Care will include space for training of adoption and foster care staff and support groups for parents as well as family-style areas helpful in the process of transitioning children and youths into foster and adoptive families. Old Main’s first floor will continue to house the Brandywine Community Library, the historic Putz train layout and some staff offices. Plans include eventual development of a center to highlight the history of the Topton and Tressler orphanages, the two homes for children in Diakon’s past. He indicated the history center, when developed, will recognize Ebersole’s role in preserving Topton’s past. Overall, he added, the renovation work “will be done with care and respect for the building’s historical character and appearance.” Old Main is listed in the National Register of Historic Places. See the main Diakon Facebook page for more images of the event.